I chose to mix them with a couple of other dishes so they could be highlighted more. Their dark color proved to be challenging to take pictures of! Swirl dish felt Asian in design so I decided to work with that theme. This very oversized hurricane was chosen and I put river rocks in the bottom, set a tall pillar candle in the center and used some miniature sea shell covered balls to accent around it. 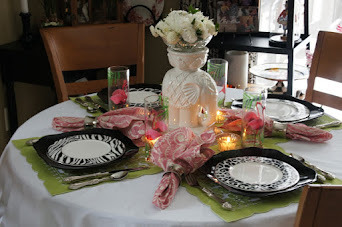 The white placemats also have a pearly swirl design on them and my white flatware came into play again! These glasses are unique in their slightly swirled design and I was lucky that their green color worked well with everything else! 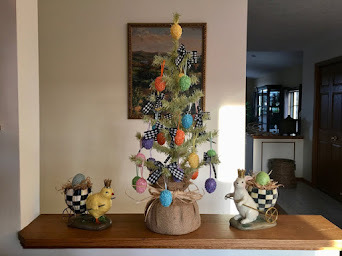 I have to admit I started out with a whole different idea, but once I started rummaging through my linens, dishes and flatware my direction took a new course! We are having a homemade coleslaw, rice, shredded pork and egg rolls for dinner! Your table looks fabulous! Great photos Liz! The napkins ~ their texture really shows up in your photos. Thanks Pam- my new camera is definitely an improvement! Thanks Barbara- It was quite a surprise to me! Turned out beautiful Liz!!! Lucky you to win such a nice set! Thanks Tess- it was a lucky day! Beautiful dishes Liz. They caught my eye on facebook and I had to come see them. What pretty photos too. Thank-you Debbie! I had to jazz them up a bit! My new camera helps a lot! congratulations on the win and what an outstanding table! Congratulations on winning the dinnerware! That's pretty neat! You've displayed it beautifully with the greens, reds and whites. Everything is lovely. Love your glassware and napkins, too. Thanks- I do love all those colors! Congratulations on the win! This table is stunning and your meal sounds delicious. Thanks Sandra- The meal was good! I'm glad you liked the table! Lucky you! I really love the way you've styled the chocolate brown dishes with red and green accents. Your table looks very sophisticated! Great photography, too -- I enjoyed the "birds' eye" views a lot! Thanks Tricia! I am loving my new camera. I'm getting much better results! I felt lucky to find some good accents to work with the brown dishes! Congratulations on the win! And thank you for that reminder about that site. I remember when it first went up Yvonne of Stone Gables posted about it. I have to go check it out. The dishes are beautiful, what a rich color. Love all the natural elements too, very earthy! So glad you visited so I could find you and follow you! I am going to poke around your older posts! Thanks Kathleen I appreciate your kind words! I heard about the Mikasa sight through Bill @ Affordable Accoutrements as well as Yvonne- I miss her and Bill (he hasn't posted much lately)! Thank-you! The new camera helps a lot! Your photos are always amazing! Beautiful post. The dishes were a treat to see and you are a lucky person. 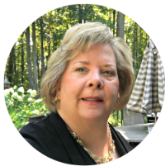 Thanks for stopping by my blog and leaving a message. 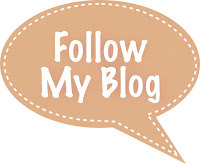 Now I can follow your blog. Thanks Judy! Loved your post too! Big time congratulations on your fabulous win!!! The deep chocolate will come in handy for a LOT of occasions! I love the way you brought in the white for contrast and the red for pizzazz. Terrific combination! The touch of green pulled from the red floral dishes is perfect, and I love the way you made that napkin stand at attention!!! At first I thought the placemats were made out of actual crushed shell before I realized they were fabric. They have a wonderful shimmer to them! Oooooohhhhh...I'm so excited for you! Have fun with those dishes! You know that describes me perfectly! Contrast and pizzazz oh and modesty! :-) I was pleasantly surprised I had won something!! Congratulations on winning the dishes! You set a beautiful table with them. The little bits of red and green really complement the chocolate and white. Love the green glassware, it almost looks like a shade of lime. You know those glasses are nearly lime in color. I suppose the yellowishness in the green helps them work with the olives too. Thank-you Marlis! Always a pleasure to hear from you! Wow, Liz! What a fabulous win!!! I don't even know what the other colors were, but I would have chosen the chocolate, too. What a perfect addition to what you already have. I love the layers, the white placemats, the "eggroll" napkins, the pretty goblets, and your elegant centerpiece! Just beautiful! Thanks for checking in with me on Elaine's Wonderful World! Glad to see you back! I think the chocolate was the best color they offered, but that's only my opinion! :-) Thank-you for your compliments! Lucky you! They are wonderful. Such a warm delicious color and I love how you paired it with the vibrant red and green. I love the way you placed the napkin too. You will love these forever! These are a good basic for sure! I had to punch up the color a bit! After many attempted pairings the red won! Thank-you Poppy! I appreciate your comments! 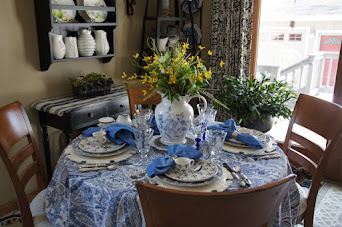 Your Tablescape is Gorgeous with your new dishes Liz!! love the way you have put this all together. 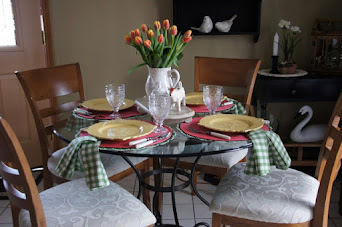 Thanks so much for your lovely comments on my 2011 Tablescape for Valentine's day. I hope you and your family have a wonderful weekend. I'am going to put a new Tablescape on this Sunday for Valentine's hope you come see me. You are so lucky you won the dishware. Congrats again Liz....you deserve it! Your tablescape is quite charming. Thanks Linda! Yes Chelsea is anticipating my giving them to her! Congrats again Liz. Your tablescape is Gorgeous with your new dishes. 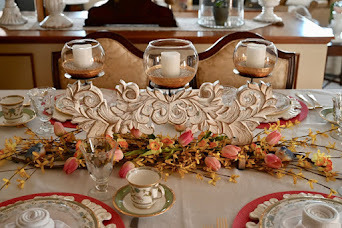 Thanks so much for your lovely comments on my Tablescape for Valentine's day. I hope you and your family have a wonderful weekend. I'am going to put a new Tablescape on this Sunday Yes!! This one is for Valentine's Day..this one will be Victorian hope you come see me. Liz, how fun that you got to 'play' with NEW DISHES!! ♫♫ Lucky-Dog, Lucky-Dog ♫♫ Congratulations on winning some awesome pieces. I like what you did to accent them, too. I know you'll get lots of use out of these...they're very versatile.